Following up on the February 7th blog post that featured Dr. Brooke Goldner, best selling author of Goodbye Lupus: How a medical doctor haled herself naturally with supermarket foods, we're sharing some of her nutritional guidelines on how to eat your way out of autoimmune disorders. The advise below is proved to be true: it healed Dr. Goldner from Lupus completely. At this point, her doctors don’t consider her in remission anymore, they consider her 100% healed. Dr. Goldner’s tried and tested tips are much like the basic guidelines of our Eat to Beat program which is designed to help you heal from autoimmune disease. Start reading so you can kick your own healing. If you are super motivated and prefer a sprint over long distance running, you can change your diet all at once. If you have difficulty embracing too much change at once, you can take this one step at a time. Choose the path that will lead you to success, because being successful at this is what matters most. The worst thing that can happen is you feel like a failure and give up. You can do this; take it at your pace. A great place to start is by eliminating the foods that are causing your illness. Let’s focus on the foods that cause chronic inflammation, which leads to chronic disease. These are the foods to be eliminated if you want to create maximal health. If you don’t eliminate these foods, you will continue to contribute to the cause of your illness, even if you eat more healing foods. Animal Products include all types of meat like beef, pork, lamb, fish, and chicken. It also includes eggs and dairy products. The reason these foods must be avoided at all cost is because they cause massive amounts of inflammation in the body. Research has indicated animal-derived products are inflammatory in multiple different ways. Meat and dairy also are a direct source of arachidonic acid and other omega-6 fatty acids which create inflammation in the body. 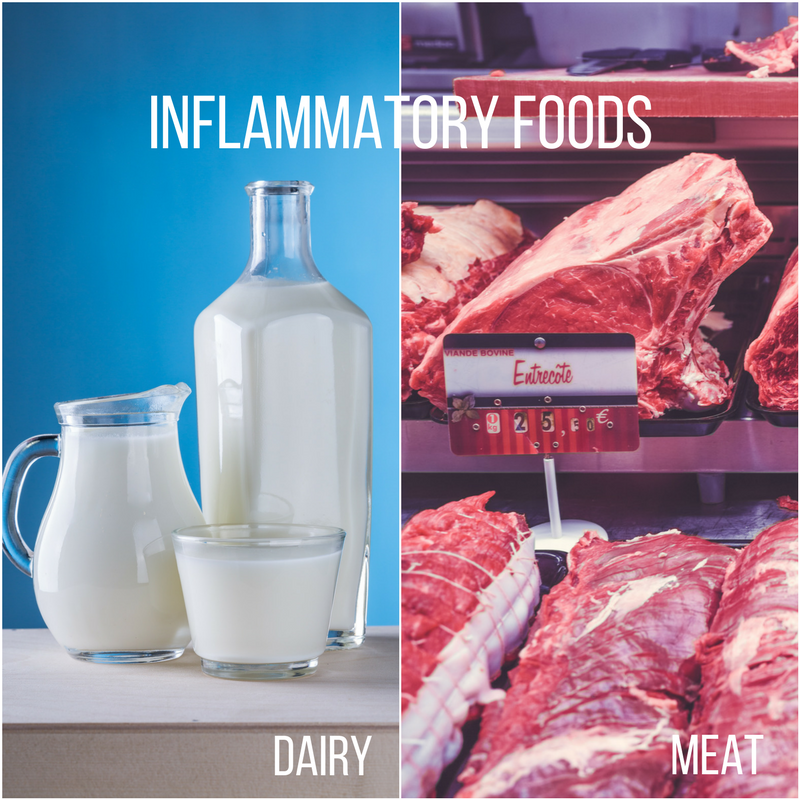 The more meat and dairy you consume, the more inflammation you create. You may have heard that omega-6 fatty acids are essential fatty acids, which means that our bodies cannot make them. We must consume them in our foods to get our omega-6 needs met. This is true. The issue is that most foods people eat nowadays, such as meat, vegetable oils, and processed foods, are heavily laden with omega-6 fatty acids, but their balancing anti-inflammatory counterpart, omega-3s are largely absent. The result is that most people are suffering from massive amounts of chronic inflammation, which leads to chronic inflammatory diseases like autoimmune disease. Our society consumes enormous amounts of dairy products in the form of milk, cheese, yogurts, and ice cream. Dairy not only causes massive amounts of inflammation, which can trigger and sustain autoimmune disease, but it also causes a whole host of other diseases such as cancer, obesity, osteoporosis and diabetes. When I teach this information to my clients, their first concern is, “how do I get my calcium?” They fear that without dairy products they will weaken their bones. Research has shown that dairy products actually cause bone loss, explaining why countries that have the highest rates of dairy consumption like the USA, Canada, Norway, Sweden, Australia, and New Zealand, also have the highest rates of osteoporosis. Calcium is abundant and easy to absorb from green leafy vegetables like kale and broccoli, without the risks that come with consuming dairy products. Animal products are highly addictive and it can seem impossible to give up these foods, but the less of them you consume, the better you will feel. You need to eliminate them completely to have the best chance to heal. The flooding of our bodies with these omega-6 fatty acids just drives the body to create more and more inflammation, which creates more illness and impairs your body’s ability to heal. I’ve had a handful of clients who were already vegan who came to me for chronic inflammatory health issues, perplexed as to why they were sick. The continued eating of processed foods and vegetable oils is usually the culprit, and when we correct their omega-6 to omega-3 ratio, they feel better quickly. True, olive oil is not a big source of omega-6, so it isn’t inflammatory like the other oils and won’t drive the chronic inflammation that fuels autoimmune disease. However, too much of any oil will disturb the fluidity of your blood in your blood vessels. It basically gums up the system while it’s in your body. That is why I consider them items that should not be in your diet when you want to heal from an inflammatory illness. The more you avoid added oils, the better your cells, organs, and immune system will function. If you feel there is no time to waste, and you want to start your healing NOW, sign up for our Eat to Beat online program. This 5-week program will set you up for success. With the support of the Richer Health team, you will make a change once and for all. Processed foods are products that you can buy that contain ingredients that do not occur in nature. People call them foods, but they’re more like synthesized edible products. So what exactly are processed foods? One quick way to find out is to grab a can or box from your kitchen and read the label. If it has a long list of ingredients that you cannot pronounce or it cannot be produced without a lab, it is processed. It is common in many households to reach for a box or a can when preparing a meal, or to grab something from the freezer and stick it in the microwave. Eating this way is convenient, and often cheap, but it does not provide optimal nourishment to the body. Processed foods are not only lacking in nourishment, they have been shown to cause inflammation in the body shortly after consuming them. This includes processed sugars as well as refined grains such as processed breads, cereals, pizzas, and tortillas, which have been shown to increase inflammation in the bloodstream and directly increase rates of diabetes and heart disease. Processed Foods are also normally bogged down with oils, making them just another contributor to the flood of omega-6 fatty acids most people consume on a daily basis. When you are trying to heal your body, all foods that increase inflammation must be avoided. If you can eliminate animal products, excess oils, and processed foods from your diet, then you will immediately cause a decrease in the inflammation in your body, and you will start feeling better very quickly. Our bodies were not, and are not, meant to digest any of these foods – yet they have become the main sources of food for many people today. That is why people are so sick. If you are one of those people who eat mainly meat, dairy, oils and processed foods, then take this as good news, because there is hope! "You can make a difference in your health just by changing your shopping list." If you enjoyed this blog, sign-up for our newsletter to receive future updates.